I don’t tell people what they should do when it comes to exercise and nutrition. I help make it happen. After years of being a burned-out, comfort food junkie, I’ve completely and sustainably turned around my entire relationship with food. Today, I help thousands of struggling professionals in North America make empowered choices that give them energy, momentum and enthusiasm — for life. Not so long ago my health and anxiety levels were a complete mess. My relationship with food had been deeply flawed for many, many years. Junk food was used as a reward for good behaviour as a child. Chips. Cookies. Frosted Flakes. I ate them all. As a teenager I was diagnosed with ADHD – no surprise after spending the better part of my youth with a can of Coke in one hand and a Snickers bar in the other. Coming into adulthood, my health began to plummet with even greater rapidity. Managing a pizza chain while I earned my bachelor’s degree gave me unlimited access to as much pizza as I wanted to eat, leaving me with forty pounds of extra weight, low self-confidence and a host of burgeoning health problems. Once graduating with a degree in Sociology and a diploma in International Business Management, the stresses of being a working professional only served to aggravate the situation. I soldiered on by medicating myself with candy bars and potato chips. I began to suffer depression, anxiety, food allergies and asthma. A life-changing doctor visit gave me the wake-up call I needed. At just twenty-six, I was diagnosed as pre-diabetic. This shocking diagnoses rocked me out of my food-induced coma. Rather than live on medication for the rest of my life, I decided it was time to take back control of my health. Everything changed from that moment. I moved to British Columbia to pursue my passion for mountaineering. Seeking to enhance my performance in rock and alpine climbing, I began studying nutrition. It wasn’t long before I’d not only lost the extra weight and reversed my pre-diabetic condition, but also discovered how to live from a place of joy and abundance. As a nutritional researcher, I found my purpose in life. I realized my true passion lay in sharing my food discoveries, helping stressed-out professionals find the path to greater health and vitality with small, healthy changes. In 2003, I founded Power of Food, a company dedicated to bringing awareness all over North America through speaking, writing, health education and a strong dose of of original, healthy recipes. Get updates, recipes and free goodies by joining my mailing list! Looking at my friends and family, I saw a similar pattern. They were living the same way I had been living in my over-stressed and under-nourished pizzeria days. I wanted to share the good news with them, that idea that they could live free from disease and discomfort without feeling chronically deprived. As the bestselling author of The Power of Food and highly sought after speaker, I’ve have helped thousands find their way back to health. 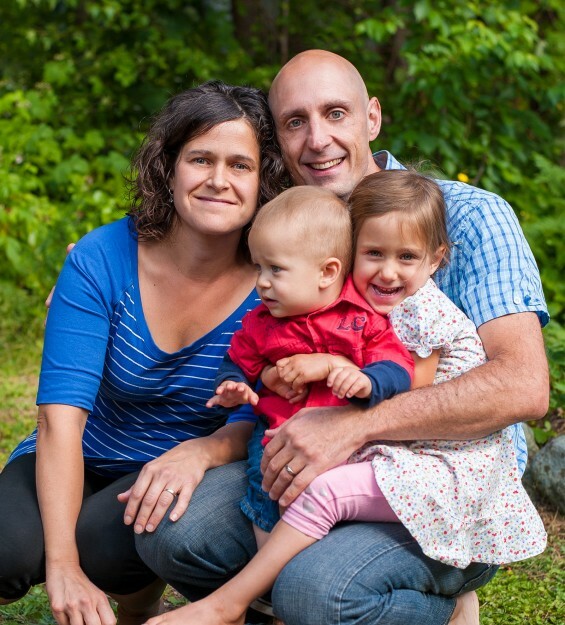 Today I live in the beautiful mountain town of Squamish, BC with my beautiful wife Suzie, daughter Juliette and son Jacob, who are the proud guinea pigs in my test kitchen. My passion for the great outdoors is as strong today as it was 15 years ago.